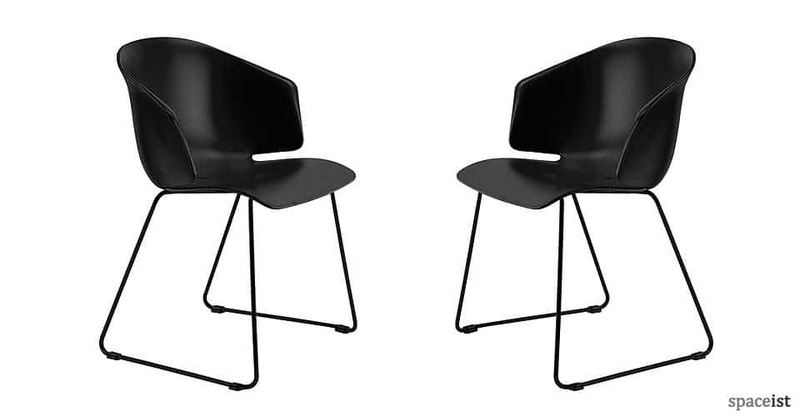 The first designer to use plastic or polypropylene for furniture was Robin Day with the ‘Polyprop’ chair; a stackable and highly versatile chair still being made and sold around the world today. 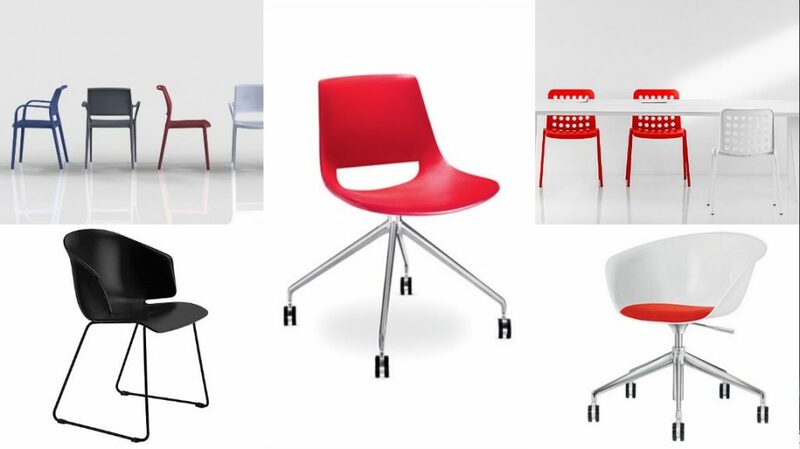 Polypropylene chairs present a range of qualities that make them ideal for a selection of interior and exterior settings. Durable, hard wearing and non-deformable, they come in a wide range of shapes, sizes and colours. 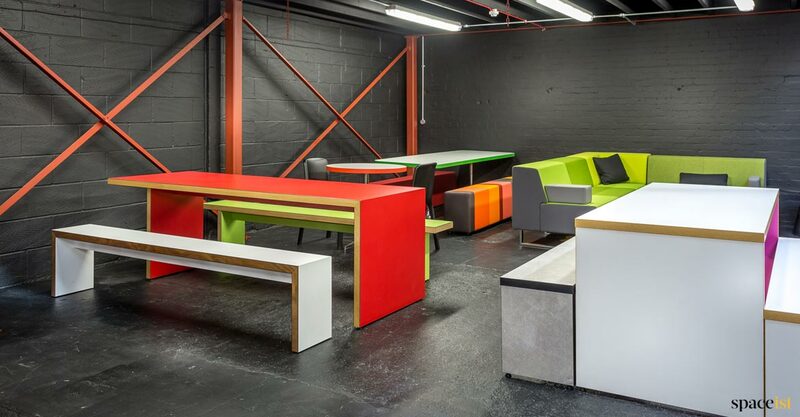 From timeless design to classical style and a touch of playfulness, we have put together a selection of five differing styles for any meeting room setting. Spanish design trio, Lievore Altherr Molina, developed the Palm chair range in 2004 to offer a flexibility to suit the flow of modern workplaces and fluid interior settings. It is modest in its form, with a design that takes inspiration from modern classics, allowing it to become easily placed in a variety of spaces. The seat shell is made from a robust plastic; polyethylene, which is resilient to harsh outdoor conditions and can be used outdoors throughout the year. The shell seat can be selected in a range of nine colours including white to red or lime and comes with five base options making it an ideal choice for multi-use. The base comes in chrome-finish steel, powder-coated steel, aluminium or powder-coated aluminum and is available in the following base configurations: sled, four-legs, four-legs with armrest, trestle and five-way base with and without castors. The Palm chair provides a good quality colourful seating option for contemporary meeting rooms. 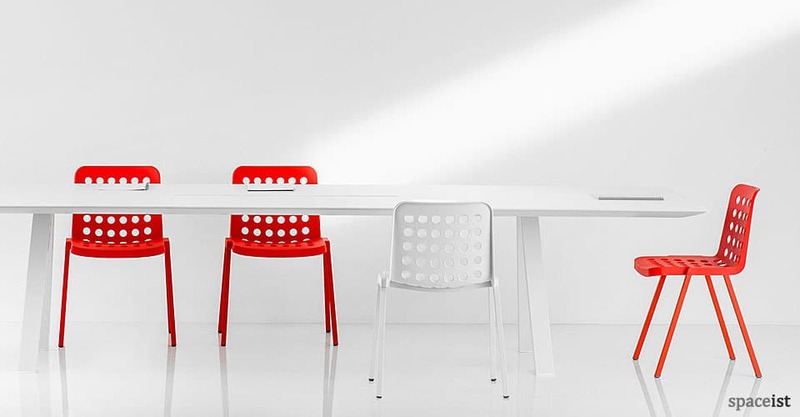 The Grace plastic chair comes from Archirivolto studio in Italy, spearheaded by Claudio Dondoli and Marco Pocci. Their products offer a special focus on affordability that doesn’t take away from the quality and level of design thought put into each piece. By working closely on innovative techniques and process, Dondoli and Pocci are able to introduce interesting materials to achieve the best results for a ‘quality-price ratio’. The Grace chair is made with robust glass fibre charged polypropylene and comes in a matte finish that is highly suitable for a wide range of applications. The addition of glass fibre also creates a UV resistant surface; the colourful surface of the Grace chair seat will not be affected when left outdoors. The curvaceous form of the armrests and backrest embraces the user, adding comfort for meeting room environments and breakout areas. 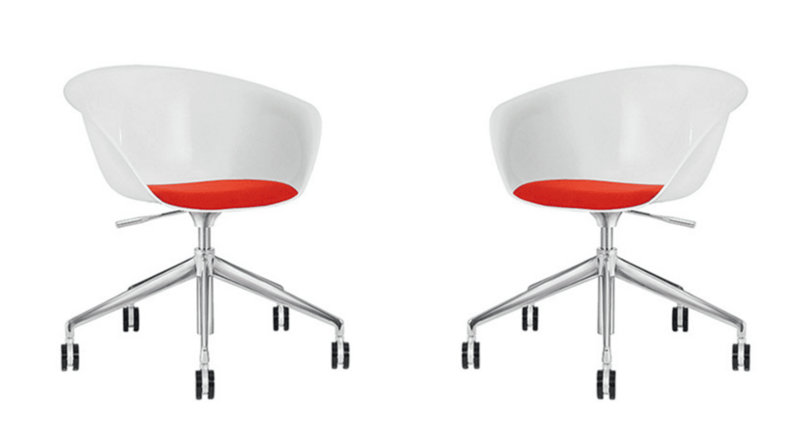 The seat comes in a choice of colours with matching powder coated steel base steel available. Developed by the Jorge Pensi Design Studio, the Ara chair is a combination of simple form and robust structure; both key for contract application. The chair is made from a polypropylene mould that has been reinforced with glass fibre, giving it a lightweight but durable composition. Integrated into the design is a functional handle that aids manoeuvrability, making it easy to lift and giving it a distinctive appearance. The seat has been designed with a slight dip and curved backrest; both enhancing user comfort. The tapered legs allow the chair to be stacked away for storage, whilst also creating an elegant look to this unassumingly strong seating option. 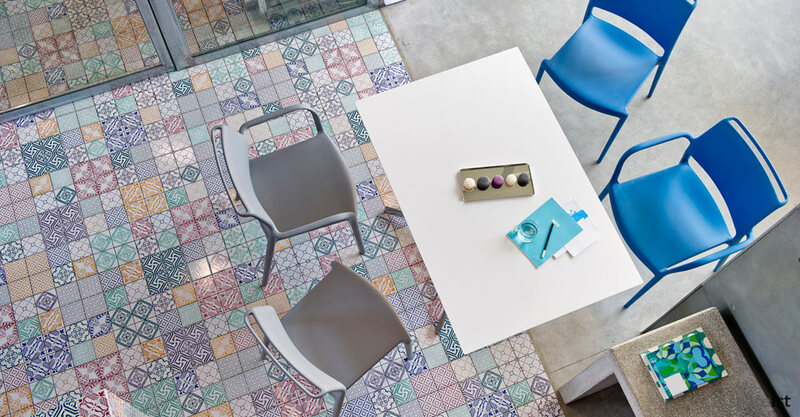 Both contemporary and modest, the Ara cafe chair comes in a range of colours to choose from and is designed to last in contract interiors. To add a fun element into a meeting space, the Book chair has been designed with distinctive apertures on the seat that is made from 100% recyclable injected polypropylene. Designed for use in both indoors and outdoors, the Book is a simple yet functioning contract chair, from meeting spaces to conference areas and breakout spaces; it can be stacked up to 15 chairs for storage or for economising on space. The base comes in matching powder coated finishes; choose from a range of bold and classic shades including white, black or orange. Designed by Lievore Altherr Molina, the Duna, an elegant meeting room chair, presents optimum comfort paired with contemporary luxury. Made with high quality splayed polypropylene shell, the organic shape is key in adding to the quality of comfort offered by the Duna. The upholstered seat cushion is available in a range of colours from white and black to more striking red, shown and more. The various base styles complement the graceful form of this contemporary yet classic piece; a brushed steel base adds both sturdy support and a tasteful finish to the modern appeal of this retro style chair while a stylish aluminium base with castors adds further functionality.